Have you ever been enchanted by the magic of fairy rings? A frequent and welcome visitor to this site, Jane, recently made a post about them. Her comments made me want to learn more about this curious occurrence, which is shrouded in folklore and mystery. These rings occur naturally, usually popping up in fields, lawns, or forests year after year as the fungus continues to grow underground. Depending on where they occur, you may either view them as a delight to the imagination or an annoying nuisance on your lawn. These shapes have a long history in European folklore, with different cultures believing they represent different things. Usually they symbolize a place where elves, pixies, or fairies appear to dance and play. As fun as that sounds, most cultures viewed them as dangerous places for mere humans. Better to avoid them than be caught up in magic you don't understand! The reality behind these rings is a little less mystical than tales of dragons and little people, but still pretty cool. In this article we'll examine the science behind this interesting phenomenon, and answer some common questions. These imaginative circles are the result of a particular pattern of mycelium growth. Mycelium is the underground organism that produces the reproductive fruit bodies that we know as mushrooms. This relationship is sometimes explained by comparison to an apple tree. If we think of mushrooms as apples, then the mycelium is the tree from which they fruit. In the case of a ring, the mycelium starts as a single point and grows in a circular shape. It continues to push outwards in an attempt to consume more nutrients. As it exhausts the nutrients on the inside of the circle, it will widen further and further as it looks for a new food source. This process results in an ever-growing circle, that doesn't start to grow back inwards or cross over on itself because there's no new food on the inside of the circle. The mycelium may have started at one point, but soon it has nowhere to go but in an outwardly, circular direction. So why don't I see more of them? Although not uncommon, fairy rings don't just happen anywhere. Multiple factors influence this circular growth pattern, including soil type and condition, amount of nutrients in the soil, obstructions underground, and dirt composition. The ground needs to be even and well composed, a reason why you'll often see them pop up on lawns. The chance exists that you've seen more fairy rings than you realize. Although we only notice them when they produce mushrooms, the circular mycelium underground is always there and growing. The most obvious clue is a circle of mushrooms, however you can sometimes spot clues from the condition of the grass. Sometimes you'll see either a ring of dark green grass or a ring of dry, dead grass. Whether this ring looks lush or dead depends on the type of fungus growing and how it affects the soil. The dark circles occur when the mycelium breaks down organic material and releases nitrogen. As grass needs nitrogen to grow, the added nutrients in the soil causes it to sprout up taller and darker than the grass around it. A dead area is called a necrotic zone. This sounds like the name of an awesome zombie movie, yet the necrotic zone is really just a region of withered or discolored plant life caused by the fungi depleting the soil of nutrients (usually nitrogen). So if you see an odd circle of either dead grass or dark green grass in your lawn, there's a chance that someday a circular ring of mushrooms will fruit. Are there different types of these rings? Fairy rings appear in two different classifications: free and tethered. These terms result from how the mushroom feeds itself and where the ring appears. Free rings are usually found in meadows, fields, or lawns. They're called "free" because they aren't connected with any other organisms. The mushrooms that pop up in these rings will be saprotrophs, meaning they feed on dead or dying organic material. Tethered rings show up in the forest, usually with one or more trees in the center. These rings are considered "tethered" to the tree because the fungus is mycorrhizal. A mycorrhizal fungus is one that has a symbiotic relationship with the roots of the tree, expanding the tree's access to nutrients and water and giving the fungus access to the sugars that the tree produces. There's some debate over which type is truly more common, but people seem to report seeing the free rings more often. No doubt because they tend to pop up in more populated areas due to their affinity for lawns. Are there certain species of mushrooms involved? Almost any type of ground-fruiting mushroom could theoretically grow in a ring, but it's generally accepted that 60 or so species make this pattern. 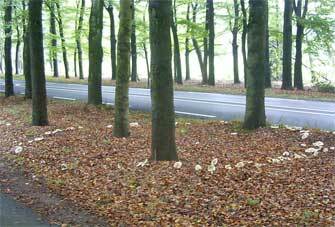 The most well known is the fairy ring mushroom or scotch bonnet (Marasmius oreades). This edible species causes the grass to grow and become greener, and is famous for fruiting in fairy rings. This list is far from exhaustive, but I hope you notice something important. 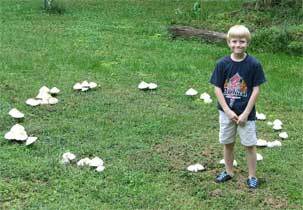 Both edible and poisonous mushrooms produce fairy rings! For this reason, it's important to never use ring formation as a tool for mushroom identification. These things are ruining my lawn. How do I get rid of them? Unfortunately that's easier said than done. The mycelium is underground, and must be eradicated completely to stop it from growing and producing more mushrooms. As one who couldn't begin to care about the state of their lawn (shameful, I know), I'll admit I've never had this problem. However, if you're looking for advice on how to get rid of the ring (and unfortunately it's not easy), check out this page from Planet Natural. You've really taken all the magic out of fairy rings with your scientific explanations. Can you give us some interesting facts to make it fun again? The rings will continue to grow over time, resulting in a pattern that can be thousands of feet wide, and hundreds of years old. One of the most impressive rings ever was found in France, and suspected to be about 2,000 feet (600 meters) wide and over 700 years old! Time, environmental factors, and animal droppings may replenish the nutrients in the center of the ring once it is wide enough. This can result in a second ring growing inside the first. Depending on the soil and the weather, a ring may expand radially from 3 to 19 inches per year. There are many other fun names for this phenomenon, including elf ring, pixie ring, and fairy circle. Old Dutch superstitions state that the rings are where the Devil churns his milk. The beliefs in Austria claimed that the legendary rings were created by dragons. 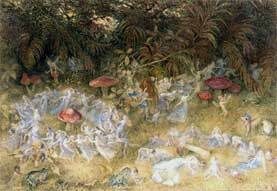 There are many, many fairy ring mushroom stories in English and Celtic folklore. Most center around the belief that the rings were places where elves or fairies dance. The legends warn against humans disrupting or joining the dance, lest they be punished. Similar tales arise in French and Scandinavian folklore, but the magical rings aren't restricted to just Europe. Stories of tiny spirits inhabiting these rings come from the Philippines as well. Fairy circles continue to inspire to this very day. People still talk of them, and delight in their seemingly planned-out shape. They've even joined the digital age by making appearances in video games! Have you ever seen a fairy ring? Do they have a history in your culture? Although science now knows the true reason for this phenomenon, I think the fanciful rings will still spark the imaginations of both young and old for years to come! Picture 3 is by Pim van Tend and is published under the GNU Free Documentation License.